I’ve probably forgotten to include some incredibly obvious marketing channel. Be sure to let me know when you spot it! For the purposes of clarity I have taken a wide-angled view. ‘Websites’ is a catch-all word that covers a lot of owned media, and perhaps a bunch of earned too. ‘Stores’ might be relevant for retailers, but not for other offline businesses (‘Offices’). Also, my focus is on channels / platforms, as opposed to marketing techniques (e.g. ‘behavioural’). If in doubt I will have placed a channel in what I consider to be the most suitable area, even if it could live elsewhere. Yes, PR can generate leads, but it mainly aims to raise awareness and positively shift consumer perceptions. Offline lives at the top, and online is at the bottom. Don’t read anything into that – it’s just the way I poured my thoughts onto the page. That said, offline advertising spend is still many times larger than online… let’s assume that it still works. While I’m on the subject of measurement: it isn’t always easy, especially in an offline world. 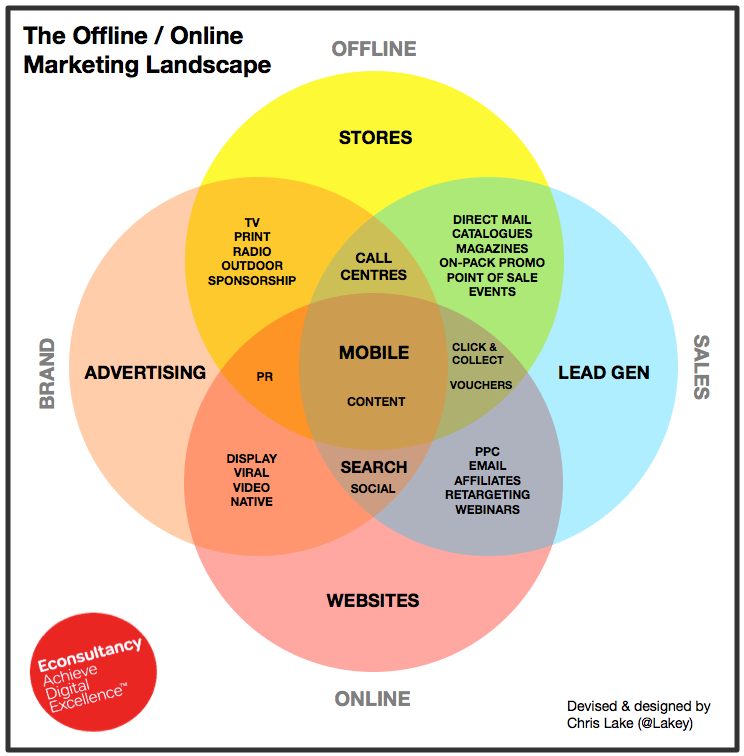 The most difficult area is the offline / brand side (TV, print, radio, outdoor). It takes time, it requires the dark art of extrapolation, and it isn’t cheap. By contrast, the online / sales side is much more straightforward, much quicker, and – for that matter – much more accurate. I was going to illustrate this on the diagram, but it looked messy, so I didn’t. Moving on to data, the offline / brand side does not normally bother with too much targeting, whereas the online / sales side relies on data to drive results. As TV evolves this should change, but for now there’s still a great deal of shotgun marketing going on. This does not imply that retargeting is flawless… it isn’t. Note that mobile lives slap bang in the middle of everything. I firmly believe that mobile is the glue that binds online and offline channels together, and it is also the most likely solution to our measurement headaches, should anybody want to solve the problem. I’ve also thrown ‘Content’ in there, as it is a channel in its own right. Some fonts are bigger than others. Largely this is to do with space constraints, and to separate one channel from another, though there is some semblance of meaning. Visual designers can give me a good thrashing in due course. I originally labelled this chart as a Venn diagram. Smarter people than me have pointed out that this is actually a Euler diagram. I hereby award you 50 points if you spotted this. I stand corrected, and have tweaked the chart accordingly. Anyway, I hope this proves useful as a top-down view of what is an increasingly complex multichannel marketing landscape. My colleague Ben suggested that in future it may look like a big grey circle, and he’s probably right (though perhaps the colour will be tie-dye, or something less dull). If you have feedback then do leave a comment below, or otherwise send word via Twitter. I’ll do another iteration at some point. Probably.